ONEIDA, Wis. (AP) Sei Young Kim became the first player in LPGA Tour history to go lower than 30 under in a performance so dominant in the Thornberry Creek LPGA Classic that she now has the tour scoring records all to herself. For all the birdies, Kim set the LPGA Tour record with a par on the final hole to finish at 257. Hee Young Park won a playoff after she and Angela Stanford each finished at 258 in the Manulife Classic in Canada in 2013 (par 71), while Karen Stupples shot 258 at the Welch’s/Fry’s Championship in Arizona in 2004 (par 70). WHITE SULPHUR SPRINGS, W.Va. (AP) – Kevin Na rode a hot putter to halt a winless streak of nearly seven years on the PGA Tour. 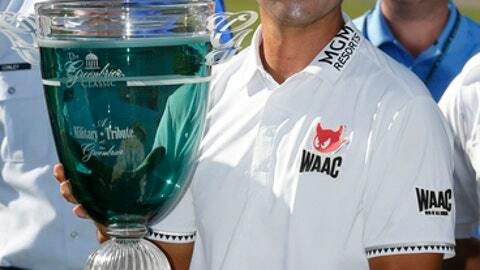 The 34-year-old Na’s only previous tour win came in Las Vegas in October 2011. Na finished at 19-under 261 and picked up the $1.31 million winner’s paycheck. DONEGAL, Ireland (AP) – Russell Knox of Scotland holed nearly identical putts of 40 feet on the 18th hole, first to get into a playoff, and then to beat Ryan Fox and win the Irish Open for his first European Tour victory. FINDLEY LAKE, N.Y. (AP) – Nelson Ledesma of Argentina seized control with three straight birdies at the turn, and he closed with a 5-under 67 for a two-shot victory in the Lecom Health Challenge for his first Web.com Tour victory. In a battle of Americans in Malaysia, John Catlin closed with a 6-under 66 for a one-shot victory over Paul Peterson (68) in the inaugural Sarawak Championship on the Asian Tour. Peterson shared second place Saturday with Danthai Boonma (66) and Jazz Janewattananond (64). Catlin’s only other victory was two years ago on the Asian Developmental Tour. … Brad Kennedy shot 8-under 64 for a three-shot victory over Hyung-Sun Kim in the Sega Sammy Cup. The 44-year-old Australian won for the first time in five years on the Japan Golf Tour. … Ben Stow of England closed with a 7-under 65 to win his first European Challenge Tour title with a one-shot victory in the Prague Golf Challenge. Stow rallied from a three-shot deficit to win by one shot over Joel Girrbach of Switzerland. … Marg Anguiano closed with a 6-under 65 for a two-shot victory over Joseph Harrison and Michael Gligic in the Windsor Championship on the Mackenzie Tour in Canada. … Sukwoan Ko of Canada won for the first time when he closed with a 2-under 69 to win the Jeonbuk Open on the Korean Tour. … Jean-Francois Remesy of France claimed his first title on the Staysure Tour by closing with a 1-under 69 to win the Swiss Seniors Open by one shot over Jarmo Sandelin, Phillip Price and Miguel Angel Martin. Ji-hyun2 Kim closed with a 3-under 69 for a one-shot victory over Jeong Min Cho in the Asiana Airlines Open in China on the Korean LPGA Tour. … Sun-ju Ahn Sun shot a 5-under 67 in the final round for a two-shot victory in the Nipponham Ladies Classic on the Japan LPGA Tour.